Saturday, December 17, 2011 ~ Half Price Books: Remy and Pippi hoping they would get adopted for Christmas by one of the Half Price Books shoppers. 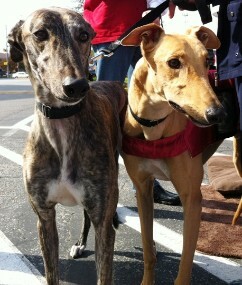 Saturday, November 5, 2011 ~ Whole Foods Market: Major and Remy greeting shoppers at Whole Foods. 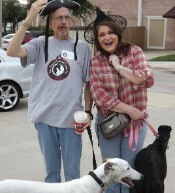 Saturday, October 29, 2011 ~ Fall Festival at Village at Eldorado: A beautiful fall day was host to lots of children (and parents) in Halloween costumes strolling the park, listening to live music and of course, visiting with Greyhounds. 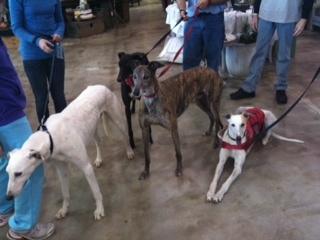 TAGS Greyhounds, Staddler, Pippi and Major, were in their glory, together with Greyhound friends, Luki and Guinness. 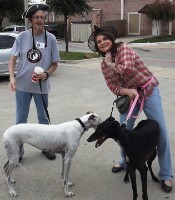 Thanks to Gail, Dana, Tom and Deann for helping TAGS to celebrate the day. Saturday & Sunday, October 15 & 16, 2011 ~ Pirate Days at The Colony: Lots of costumes, lots of children and parents, lots of pirates and wenches, lots of Greyhounds, all of which translated into “Fun was had by all.” Thanks to the event sponsors for donating the proceeds from the Salty Dog Costume Contest to TAGS. 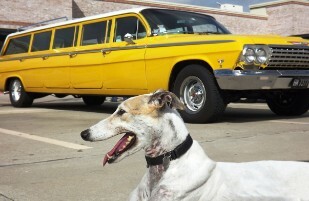 Saturday, October 8, 2011 ~ This was the last Late Great Chevy Car show at Norma's Cafe and Legacy Bank. Lots of great cars (not all Chevy's) entered. 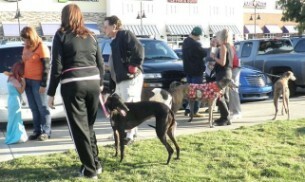 The weather was great and many spectators looked at classic cars and classic Greyhounds. 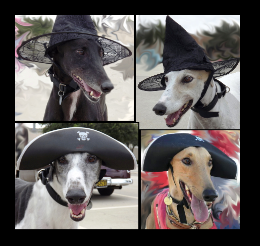 The Greyhounds (and people) were having fun trying on their Halloween hats. 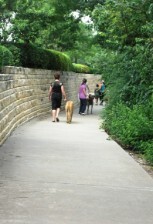 TAGS will be a part of this even again in the spring. 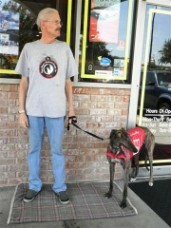 On Friday, July 29, 2011 ~ Major helped Norma's Restaurant celebrate National Chili Dog Day, along with "weiner" dogs from Operation Kindness. 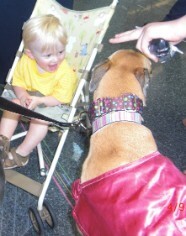 Of course, Major was a "hot dog" himself. 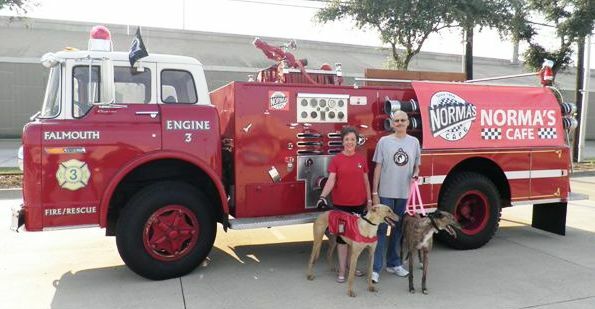 plans to participate with Legacy Texas Bank, Norma's Café and the Late Great Chevys and National Impala Association again next month. 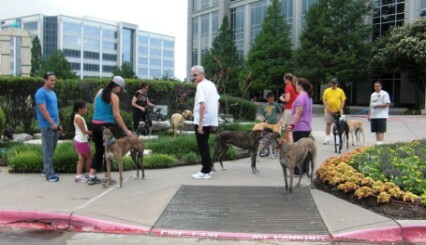 Monday, May 30, 2011 ~ An early morning walk at Hall Office Park in Frisco was a perfect way to start celebrating Memorial Day with the Greyhounds. 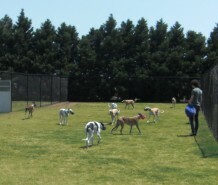 On Sunday, May 15, 2011, it was a sunny, breezy afternoon when all the Greyhounds ran free (well, not really “free” but in a large fenced area at Paw Beach Resort). 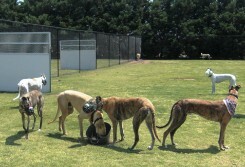 They ran, they played, they chased Flower (who chased the ball), they splashed the water (and ultimately turned it over), and they found a place to lay in the shade. 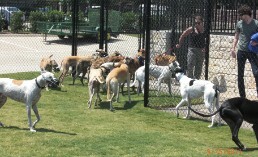 Thanks to Paw Beach for inviting TAGS and its Greyhound friends for an afternoon of fun. 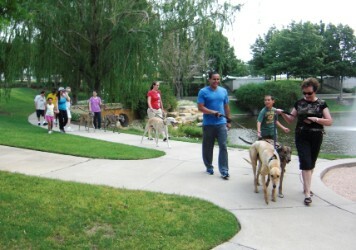 After a rest, the Greyhounds can’t wait to do it again. We’ll let you know when and where. 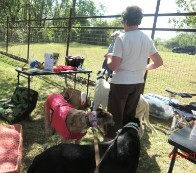 The DFW Basenji Club hosted their annual Spring Fun Run Lure Coursing for all sight hounds at the Haggard’s Corner Creek Farm in Celina, TX. 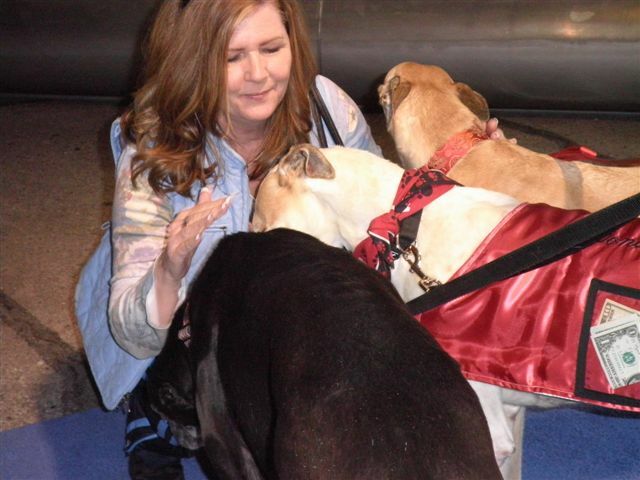 Thanks to Deann and Sam Haggard for opening their home to all the people and dogs. 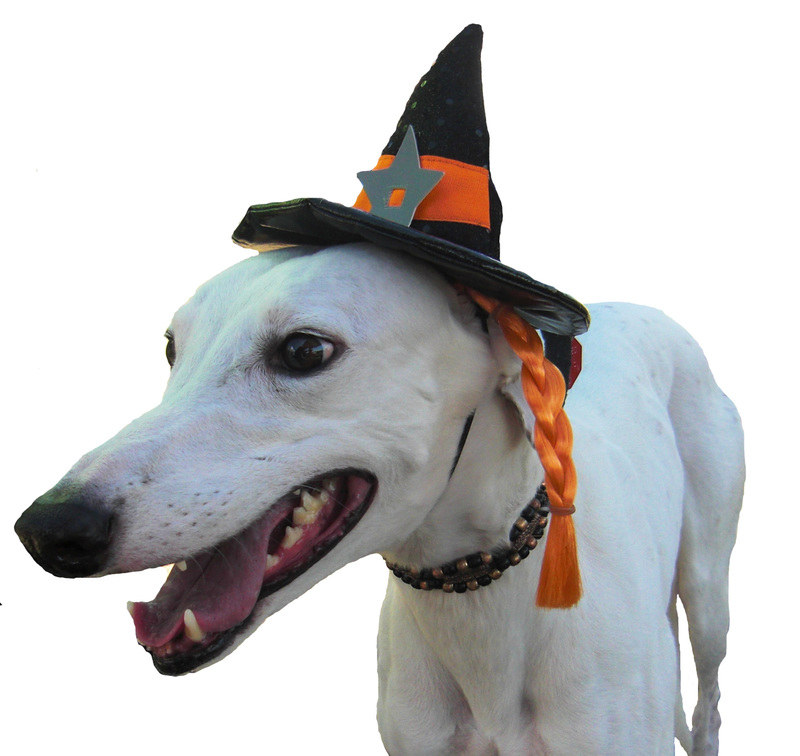 Some hounds were in it to win it, some were just there to have fun. 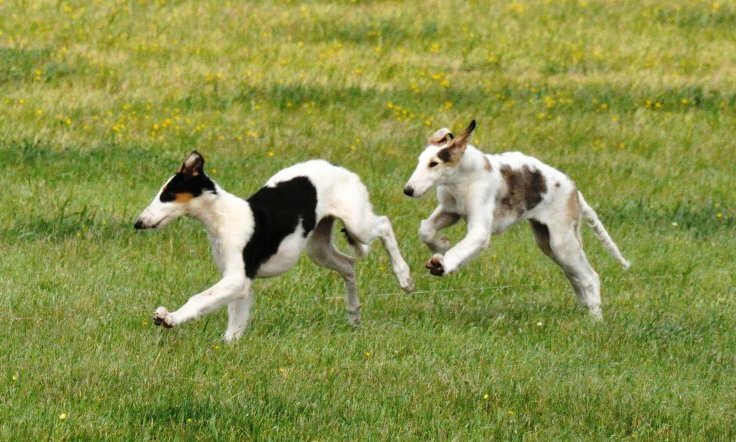 Even some puppies got to try their skill at lure coursing. 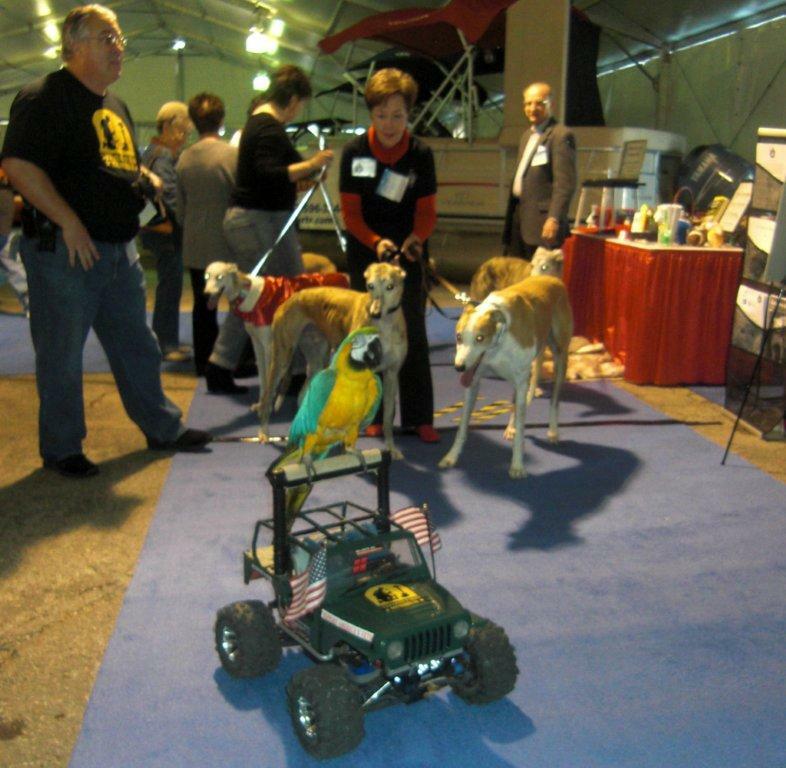 The weekend at the 2011 Dallas Auto Show was a successful event for TAGS. 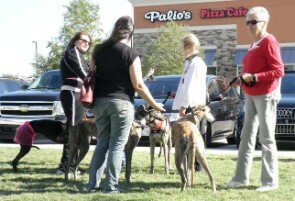 There were almost as many people looking at Greyhounds as looking at cars (both are fast, of course). 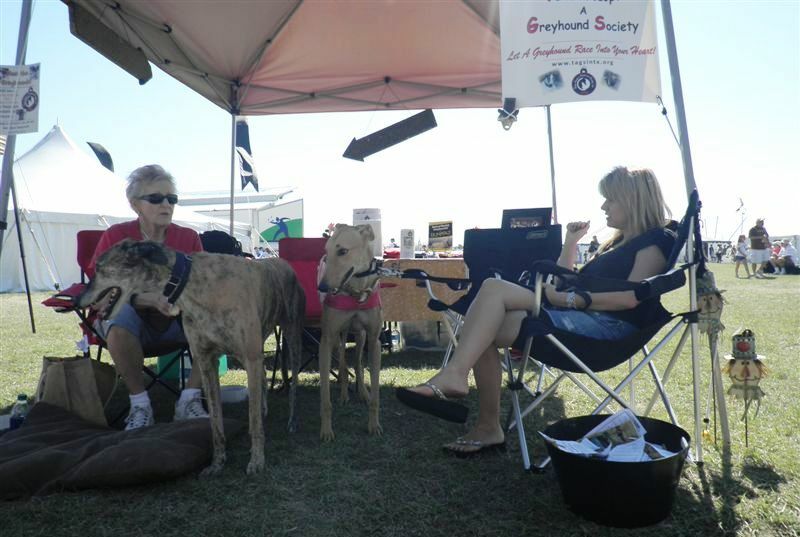 The Greyhounds appreciated the TAGS volunteers telling the public about them so they could save their energy and barks and snooze the afternoons away. 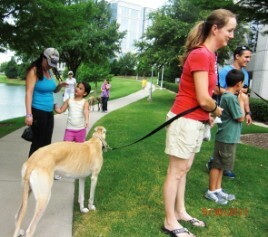 Many more people are aware of the wonders of Greyhounds after this greyt event. 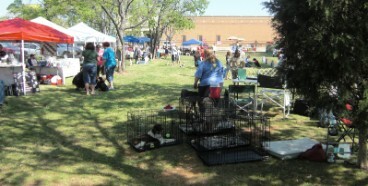 TAGS joined the fun at the Pooch and Pals event sponsored by Cowtown Loves Animal Shelter Pets (CLASP). 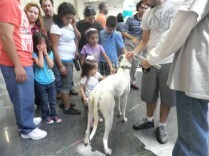 application, the TAGS Adoptable Greyhounds were joined by friends, Wiki, Ringo and Luke, to greet all the people who wanted to pet the dogs and receive information about Greyhounds. Saturday, March 5, 2011, turned out to be a rather chilly, windy day, so lots of people decided to shop inside at Frisco Mercantile. 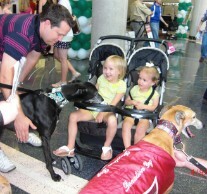 They were delighted to see the TAGS Greyhounds as soon as they came in the front door. 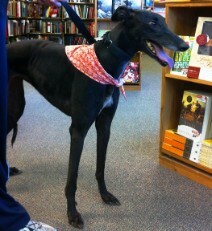 Standing calmly to be petted for two hours is hard work. 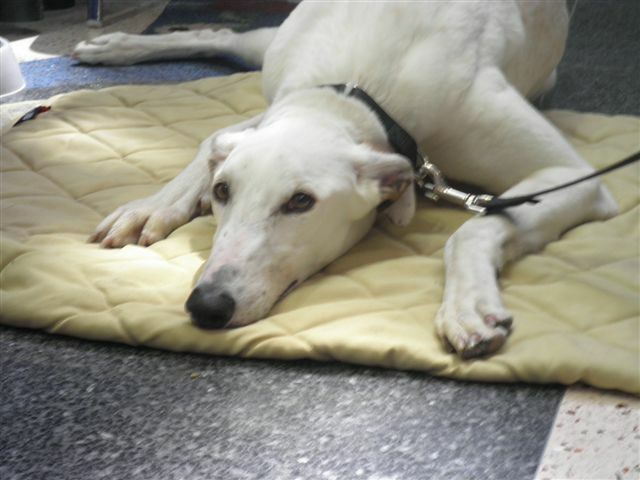 Milady, the donation dog for the day, decided she would rest while Bear, Wray and visitor, Wiki, remained standing, hoping for more attention. 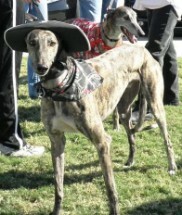 When you are at Frisco Mercantile, visit the TAGS merchandise booth (even if the Greyhounds are not there that day). 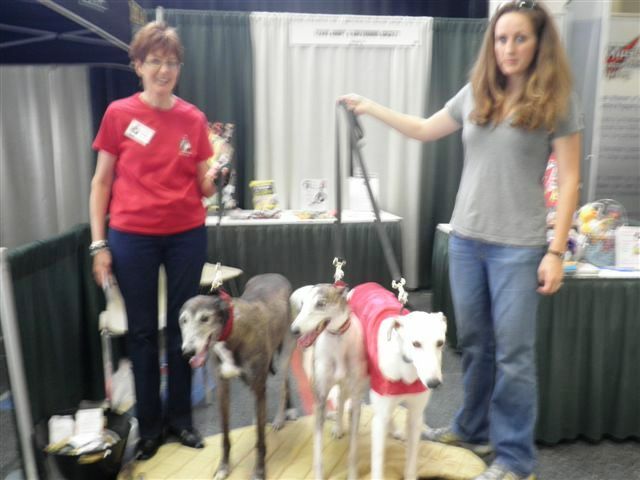 These were perfect days for TAGS and the Greyhounds to visit with all the people looking for spring and summer gardening ideas. 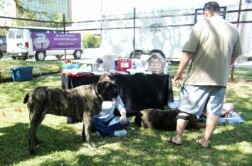 Based on the number of people who stopped by, the event was a huge success. 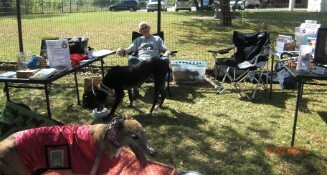 The public was very generous with its donations which makes the Greyhounds happy!! 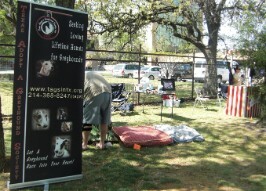 TAGS hopes to participate again next year!! 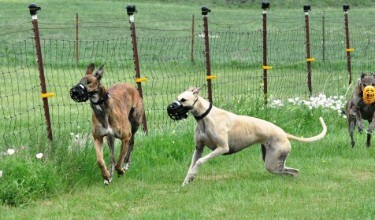 Check out the greyt photos. 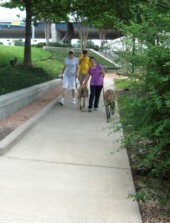 Many people had cabin fever after the blast of winter weather in Dallas and could not wait to do something fun. 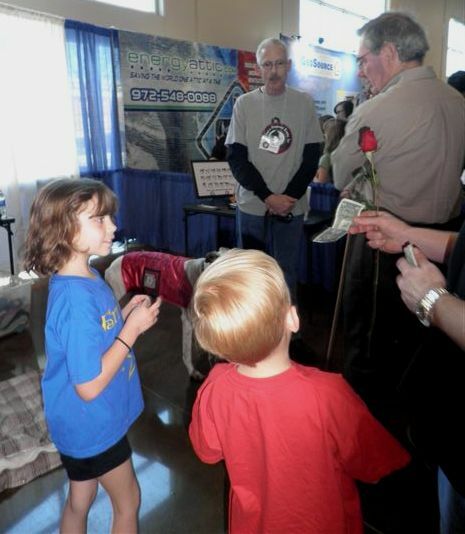 The Dallas Boat Show on February 5 and 6, 2011, was just the ticket. 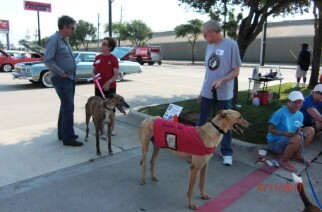 TAGS volunteers and the TAGS Adoptable Greyhounds plus many owner Greyhounds met the public and paid no attention to the weather. 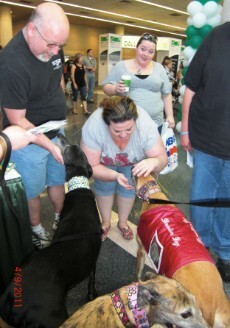 All the dogs were more than willing to get petted, receive hugs and collect needed donations from the generous show guests. 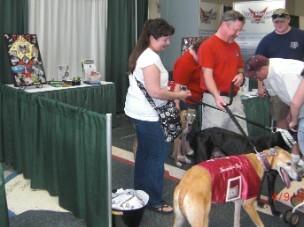 Many people say they look forward to seeing the Greyhounds at each Boat Show. 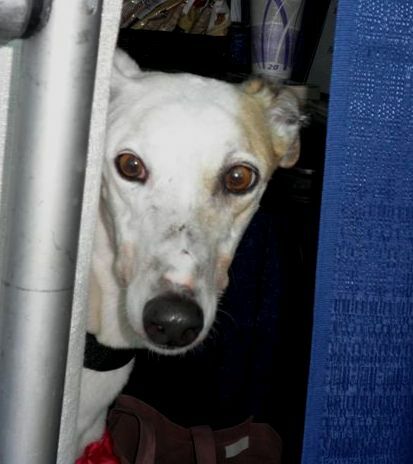 They even noticed that TAGS was in a different location. 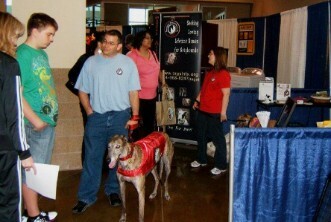 Thanks to all the TAGS volunteers who braved the weather and helped spread the word about Greyhounds. “New Beginnings” can mean more than one thing. 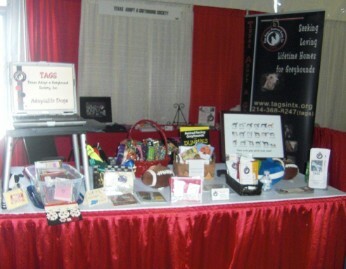 On Saturday, January 8, 2011, it meant several things for TAGS. 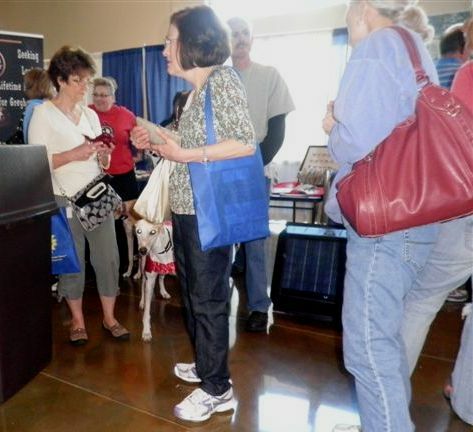 TAGS began its new meet and greet relationship with Half Price Books at Parker and Independence in Plano at a successful event. 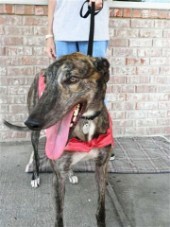 TAGS’ volunteers Julie Lauderdale and Roxanne Littman brought their new Greyhound, Lexi, to visit. 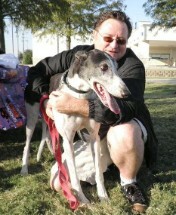 TAGS’ new volunteer, Jack Mione, came for the first time (and hopefully many more times to come). 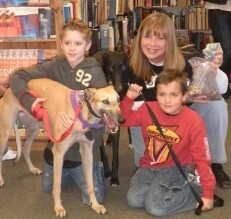 And boys, Drew Cook and Skyler Yarborough, began giving to animal causes by donating approximately $45 to TAGS’ Greyhounds. 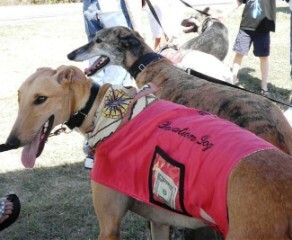 Drew and Skyler, after seeing TAGS’ Greyhounds at Pirate Days in October, collected money door-to-door to donate to the Greyhounds. 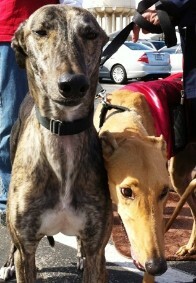 The boys were especially taken with Gigi. 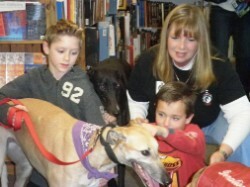 On January 8, 2011 Drew's parents, Chris and Elaine Dillard, brought Drew and Skyler to the Half Price Book Meet and Greet to personally present the funds they raised for the Greyhounds to TAGS President, Kris Schuster. 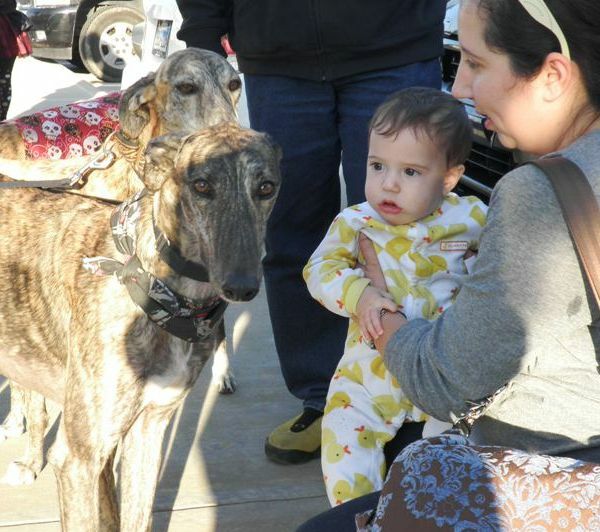 They were greeted by all of the Adoptable Greyhounds, including Gigi. 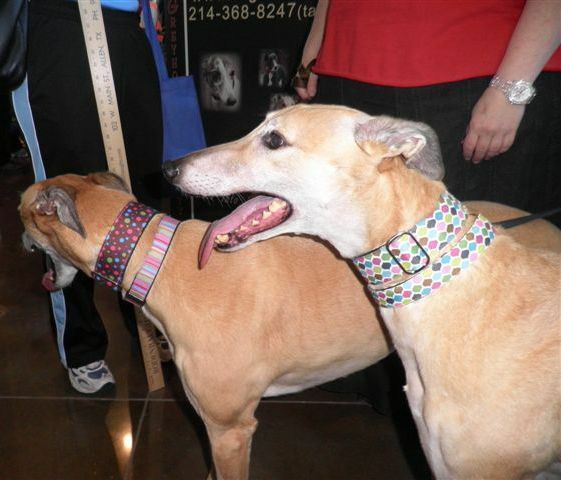 Skyler and Drew enjoyed having their pictures made with Gigi and Wray. 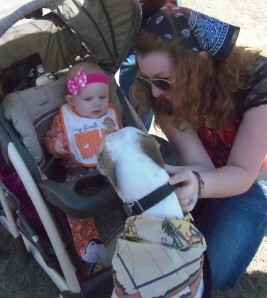 They then made their way around and got to pet Luke and Sissy, too. 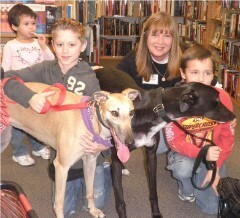 The boys learned a lot about Greyhounds and the TAGS volunteers learned a lot about giving. 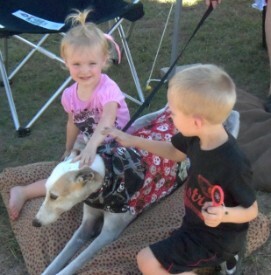 All of the Greyhounds will benefit from these children’s generosity.